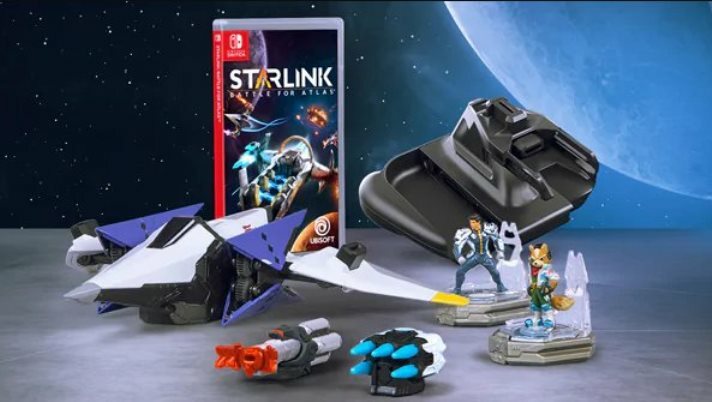 Ubisoft has announced that Starlink will be coming to the Nintendo Switch on October 16th. Even better than that is the news that Star Fox will be included as a tie-in in the game. Mr. Miyamoto joined the team onstage to reveal the news. Obviously the Star Fox tie-in is exclusive to the Nintendo Switch version. Oops clicked on Rabbids, but like I said there, Star Fox in Starlink is a huge surprise ! Has me interested now. Very unexpected tie-in. I don’t care about the game, but it’s cool nonetheless. I’m curious, what do you think of the Star Fox Grand Prix rumors? What will you think if they announce that tomorrow? I don’t really like the idea of an racing game for Star Fox since every game it’s about to shoot the enemy. Ubisoft working with Nintendo to include their ips in their games is a very beautiful relationship. After what happened with the Wii U, I didnt think Ninty would work with any 3rd party dev, but damn was I wrong, and im glad I was. Ubisoft is the perfect one too. Man, 10 year old me would be all over this game and the toys. I’m a grown up, I don’t need toys. I’m a grown up, I don’t need toys. My kid likes spaceships, it’s totally for her. If you don’t need toys, then just buy the spaceships digitally! Because you can do that in this game! Wait, am I not helping? Yeah, like I’m not going to buy the awesome spaceship toys. For my kid. Cough. Relax, Nintendo has a 45 minute direct coming. Nintendo finally found their audience. The Switch is hitting the 30 somethings with kids that are reliving nostalgia from the first party titles. The hybrid console is perfect for gamer mom/dads sharing TVs. They have disposable income. It might be the secondary gaming platform in the house or the first console they’ve bought in years. If the Switch was released identical to PS4/Xbox, it would just be another low powered box with the same mediocre third party titles, fighting over the same dollars. THAT’S when I’d say they should just go third party, because then they’d have nothing to offer the industry. Instead, they carved out their own niche, and are making bank because of it by bringing in old and new gamers to the industry. If it’s not a good fit for you, fine. Don’t buy. PS4/Xbox is great if you’re a gamer on a budget, but it would take a whole lot of platform exclusives to get me to buy one (or maybe just Kingdom Hearts, that’s going to be tough for me to pass on). I need a powerful handheld. I don’t need a crappy PC with a Nintendo/Sony/Microsoft logo on it. I think this is a second party company! Meh, I’m still hoping for a new star fox game and NOT a remake. I don’t need more stuff to clutter my house up either, I have too many figurines and amiibos as it is! Who knows tomorrow what will we have. See you tomorrow. Yeah, tomorrow might hold something amazing. I’m super hyped! https://www.youtube.com/watch?v=LRHPgRaGNDQ What the hell he says? I wasn’t hyped for this game until Fox came in. How I’m hyped!!!!! I meant NOW i’m hyped! I was already excited when I saw the teaser last year, now I’m totally pumped. I remember thinking a couple weeks ago “why doesn’t Nintendo make a starfox game like star link?”. And now this happens, so I’m pretty happy. Plus there’s something being revealed tomorrow.